The DC-3 is the plane that made civilian transport a profitable reality, and has become a legend in its own time. It has many names and designations - Skytrain, Spooky, Puff the Magic Dragon, DC-3, C-47, R4D, Li-2 and others. 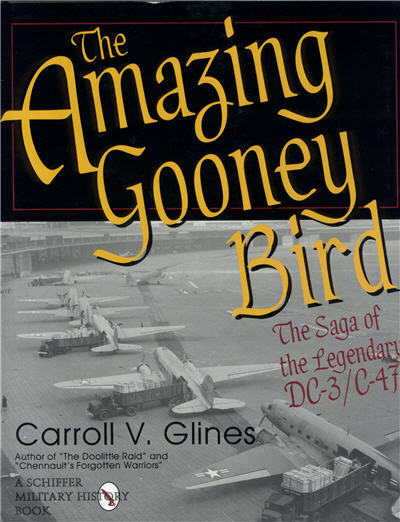 But the name that most pilots know it by is the "Gooney Bird." And it has played many roles besides being an aerial workhorse to transport people and cargo. It has been a bomber, fighter, airborne communications center, amphibian, living quarters, hospital, flying washing machine, and command post. When some of the more than 10,000 built, and additional hundreds in Japan and Russia, ended their days, they have been made into a hamburger stand, tea house, mobile home, seaside cottage, an officers club and even a chicken coop. Many have been put on static display at more than 200 museums around the world. After more than sixty years, 1,000 of them are still flying the world's skies. The DC-3/C-47 has surpassed all other aircraft ever built in faithful service, dependability and achievement. This is the story of its conception, design and amazing life in war and peace. 192 pgs, HB w/dust jacket, 8.5 x 11, 200+ b&w photos.